© Copyright 2004 – 2005, WorldNow and WBNS-TV, Inc; Republished with Permission. Stephanie Holmes is a good reader now. But that has changed dramatically over the past year. An optometrist says that’s because her eyes did not work together. “Sometimes my words would be backwards, and I wouldn’t stop at a sentence. I’d just keep reading. And sometimes when I read a long time, it got blurry,” Stephanie said. “Ten to fifteen percent of the student population may have some form of visual difficulty that can affect their school performance,” Dr. Nancy Evans says. Dr. Evans says kids like Stephanie can sometimes be misdiagnosed with attention deficit disorder. “A child has trouble staying focused up close, and they tend to look around in the classroom. And it’s not so much their attention, but their eyes can’t stay focused,” Dr. Evans explained. 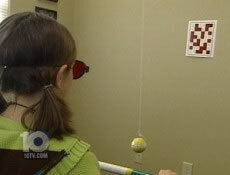 So Stephanie went through a series of exercises to retrain her eyes to work with her brain. In one case, she caught a marble in a cup while wearing prismatic glasses. In another, she jumped on a trampoline while taking a computer test. Stephanie identified numbers on the screen through a pair of 3-D glasses. In a third exercise, she matched letters while batting a ball. All of the situations are designed to teach children’s eyes to work through distractions similar to ones that might be encountered in a classroom. “It does retrain the eye muscles. But it goes much deeper. It truly is an eye-brain connection,” Dr. Evans said. Dr. Evans says reading well is key to doing well on tests or on the job. So if you suspect you or your child has a problem, see an eye doctor and ask them to test the way the eyes track side to side. 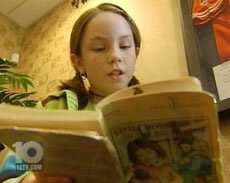 Share the post "Retraining The Eyes Can Help Kids Read"